Time passes so fast. It has been a year since we laid Kaelyn to rest. 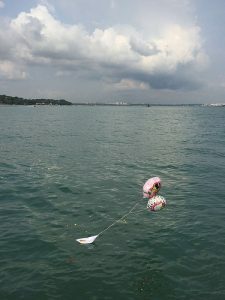 We came together and had a memorial on her 1st anniversary in Heaven at where we last bade her farewell, at the waters off Changi Ferry Terminal. We then went out to sea in 2 bumboats. My neighbour’s boy, Jayden, drew a picture for her beforehand. 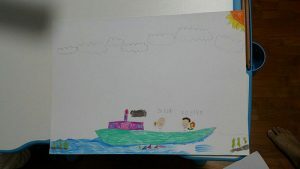 It is a picture of them out at sea on a boat enjoying the day. We went out and didn’t think of how to end with the drawing. One of us made it into a paper boat. We tied balloons of Kaelyn’s favourite cartoon character to it. 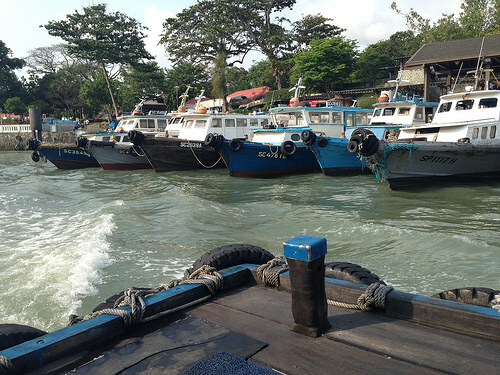 We dropped off flowers, set the paper boat off and reminisce as we watch the paper boat sail away. Truly grateful for the friends that remembers her. Also very proud of my girl in the way she left impressions among people who interacted with her. A year later after we laid Kaelyn to rest, it still hurts when memories of us together flood my head. Time heals all wounds they say. This statement is a lie. This wound never heals. It will only be buried by the hustles of life, but never healed.